The pockmarked fields of northern France have proven paradoxically fertile ground for modders in the past. 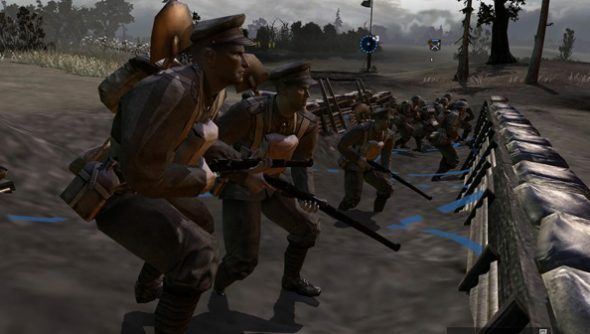 Battlefield 1942 and Napoleon: Total War were both beneficiaries of sweeping conversions – mods that changed their very nature to realign their mechanics with a very different form of warfare. The Great War does the same for Company of Heroes, shifting Opposing Fronts to a Western front fought two decades earlier. It models the clashes of the British Expeditionary Force and the German Empire from March 1918 to the armistice, and hit 1.0 over the weekend. The Great War dev team’s chosen period takes in the Spring Offensive, the second battle of the Marne and the Hundred Days offensive, allowing the mod to incorporate as many different weapons and vehicles as possible while accurately representing the tactics and aesthetics of the final phase in a changing war. “It makes fighting on stock maps more believable as in 1918 there were plenty of engagements far away from trench systems, from the flat fields around Amiens to the streets of Cambrai and the deep woods of the Argonne forest,” write the team on their moddb page. Belligerents. Ace. While this is still Company of Heroes, the dev team have allowed the mod’s specifics to be guided by the shape of the war at the time. That means the English are geared primarily towards defence and entrenchment, while the Germans are better suited to all-out offense, particularly in the late game. You’ll see much of what’s been converted in the video below, including new weapons, vehicles, artillery, planes and uniforms, as well as some of the more unusual specifics relating to trenches, poison gas and melee. The Great War doesn’t feature a new single player campaign. What it does have is support for single and multiplayer skirmishes, including automatch, and two new maps – Fromelles and Villers-Bretonneux. What’s more, it’s been translated in full to German, Spanish, Polish, Russian and French. Download it here. And let us know how you get on, won’t you? We like the sound of your voices even more than our own.